Heya, how’s 2017 been treating you so far? Did you have a great start to the New Year? Mine started quietly as I didn’t go to any New Year’s Eve parties. Going into central wasn’t really an option for me either as I didn’t see the point of commuting 1h to Westminster, then having to wait a few hours in the cold for a 15-minute firework. So yeah, sat at home in the warmth, watched some telly, called my friends and family to wish them a Happy New Year at midnight and then went to bed. My next New Year’s will be more adventurous though as I’m currently planning my trip to Australia. I’ve never been outside of Europe - if you would ask me where I would like to go if I had the choice I would always say “Australia”. Somehow, the other end of the world has always fascinated me more than the US. In school, I’ve learnt about the outback and the Ayers Rock (Uluru) as well as about the magnificent beauty of its nature, in particular, the Great Barrier Reef. At uni, I studied Australian Literature for one term and fell in love with the Aboriginal Dreamtime and culture. Something about it just calls out to me and I feel I need to go. As my 2016 wasn’t great in terms of cutting back a lot of my personality, struggling to adapt to a full-time job with barely any free time to myself, I feel now much more settled and organised and I’m ready to tackle the adventure of my lifetime. The planning, for now, sees me keep an eye out on the sales for flights. I’ve got a rough idea what I’d like to do and see in those three weeks plus a Kuoni guide for inspo and ideas. It’s in the very early stages but just the thought of travelling to the other side of the world at the end of 2017 excites me big time. Putting the plans into reality will be even easier this year as I bagged myself a promotion shortly before Christmas. The promotion has finally gone through HR and signed off so from Monday onwards I’ll be moving department at my company and start a super exciting job as an events executive and project manage one of my travel clients. Exciting times are ahead! With a career-defining job on my hands, I’m also determined to change personally and in terms of my style. I feel that I’m slowly but surely outgrowing my romantic style and tend to choose pieces that are more classy and casual. 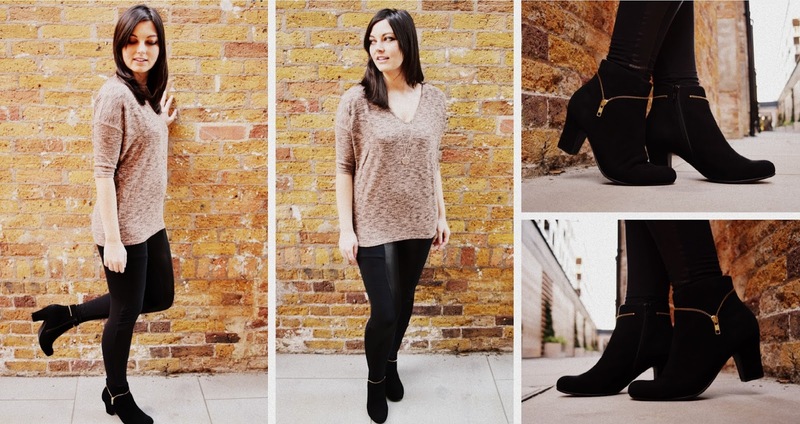 At the moment I’m loving smart leggings – not the usual uni-coloured black leggings, but stylish ones with faux leather elements that look as equally smart as a pair of trousers would. Now with leggings I usually have the problem that they are massively see through and tight, hence why I feel less comfortable combining leggings with t-shirts. I like to have shirt-blouses or casual long jumpers that go over my waistline and cover my bum so it looks less like leggings, but more than a pair of comfy trousers (hope that makes sense). For today’s outfit of the day I’ve chosen a pair from Leggsington, which is super soft and stretchy. The faux leather element runs diagonally over the legs and applies a chic touch to the overall look. In winter, I like to wear tights underneath for extra warmth and to reduce the see-through effect. Shoe-wise, ankle boots or normal knee-high boots work really well. For this look, I’ve opted for these classy suede ankle boots from Hotter Shoes. I love their zipper detailing on the side and the model comes also in other colours such as turquoise and deep purple. The heels have a great height and come with underfoot cushioning that allows a comfortable walk. In combination with the leggings, the boots transform your legs optically into infinity. This is my second pair from Hotter Shoes and I couldn't be happier with them. They usually have a wide fit so you may opt for a size down. I'm usually a solid UK7 but with Hotter Shoes a UK6.5 works just as well. The Vanity Boots are not just great in the daytime for the office, but they are also extremely comfy to dance in after work. The casual jumper from New Look finishes off the look. The material is super soft and the cut allows a casual fitting for that extra laidback touch. Accessory-wise I’ve teamed the outfit with a long neckline pendant necklace from Accessorize and my go-to Daniel Wellington watch. 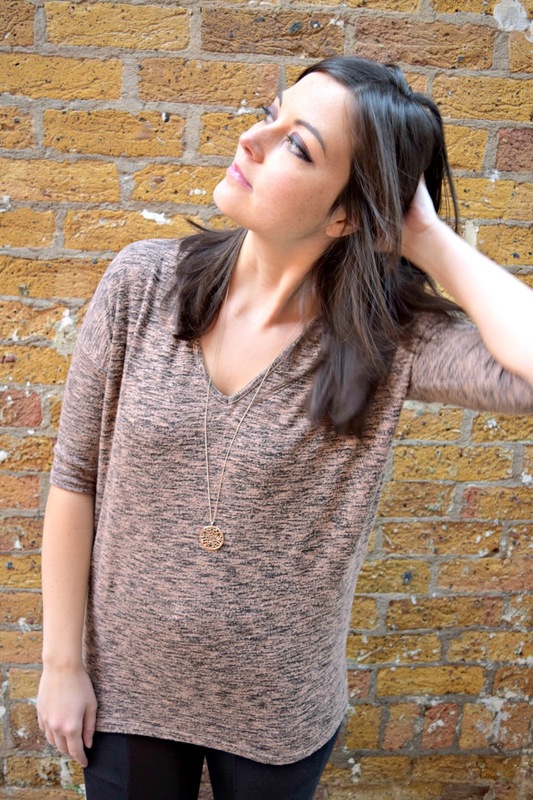 Thank you so much for checking out today’s post including my casual New Look jumper outfit.